If you are a budget traveler and want to explore Japan, this kind of ticket will really help you. But don't forget, cheap means that you have to be ready to be more exhausted and have some limitations. 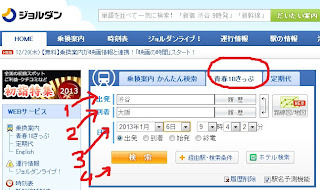 Firstly, what is Seishun 18 Ticket (青春18きっぷ)? Well, you can get the information from here and here. Basically, it's like one kind of JR Pass, valid to travel through out Japan in JR lines, but you can't use shinkansen (of course...). 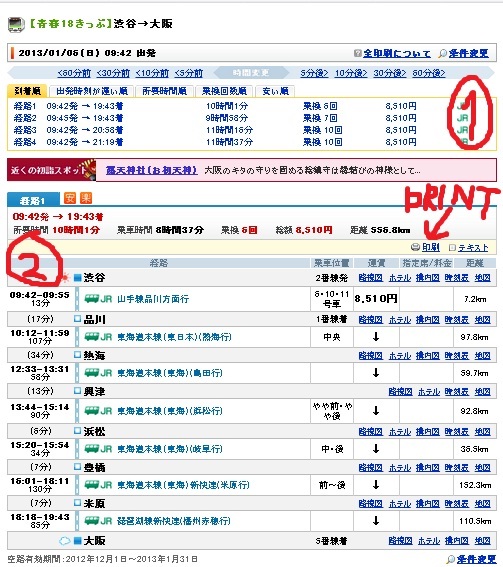 You're only able to use the Local train (普通) which will stop at every stations, and rapid trains (快速) or some special express trains which will skip some stations. The ticket has five slots for 5 days usage. You can use it for five days, also available for consecutive on nonconsecutive days. You can use it with your friend together, so if you won't travel a lot, you can share the ticket. How to buy the ticket? You can go to every JR station and buy it at the ticket vending machine. Unfortunately, the english version on the vending machine doesn't cover all types of JR tickets selling. You should try Japanese version and do some "guessing game" to buy it (it worked for me every time). If you can't do it, just go to the ticket booth (みどりの窓口 midori no madoguchi) and buy it there. Of course, if you are a budget traveler, with limited money (more over, everything in Japan in really expensive), you can buy this ticket. The price is 11,500 yen (worth 2,300 yen for one day ticket usage). You can go in one day Tokyo-Kyoto, or Osaka-Kyushu, or many other places cheaper than shinkansen (of course...) and night bus. Night bus usually around 4,000-5,000 yen for one trip on weekend, and you can also get 3,500 yen JR night bus on weekdays for Osaka-Tokyo. Using trains, you can stop at random stations and exploring around. For example, during the Tokyo-Kyoto trip, you can stop at Nagoya station on Gifu station, window shopping for the omiyage and exploring the area near the stations. May be you want to stop at Hamamatsu station, which I don't even know what is in there. You can plan your trip based on your need. For example, the date and the time departure. You can also stop at any station to go to the toilet. You can stop by and traveling as long as you want. Oh, but don't forget to keep track of the train timetable. You have to be prepared to do a lot of transfers. You will travel until the last station of the line, and then you will transfer to another line. My Osaka-Tokyo trip had about five to six transfers. Sometimes, you should move very fast because you have to go to the other platform in 2 or 3 minutes to take the very next train. Not to mention, there is no guarantee that you will get a seat since it's not reserved. If you bring a big luggage, prepare more energy for transferring. You will depended on the train timetable. You can't go before 4 am because there is no train at that time. This is also means that you should travel in daylight and spend one day only for traveling on the train. Well, there are some special trains, such as Moonlight Nagara that runs on midnight, but you will spend more money to use it (more info: here). I can't explain more because I haven't tried it. How to planning the trip? Don't use the english version, it's not good. Use the Japanese version, and if you're confuse, use google translate which always works for me. For example, you want to go from Shibuya station to Osaka station. Number 1 is the station where you will depart (I wrote "Shibuya" and they will automatically show some options in kanji). Number 2 is the arrival station (I wrote "oosaka"). Numer 3 is the time. You can choose whether it's the departure time (出発) or arrival time (到着). Then, click number 4. This is the result. Number 1 shows some options, about how long the total duration of the trip and how many transfers. Don't mind the price, because you will use 18 kippu. Number 2 shows the detail of the trip. What train you should take, what time, how long you should wait for the next train, and even which car you should be in to make it easier to do the transfer. Once again, if you're confused, use the automatic translation. You only need to follow this plan, because it's 99,9% true (0,1% is when there is "something" such as disaster or accident). You can also print the plan if you don't have Japanese smartphone. 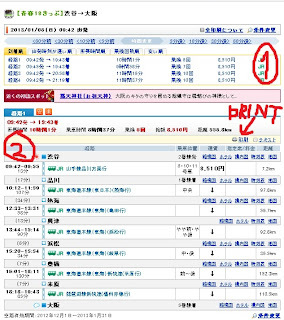 Once you have the printed version, stick to the plan if you don't wanna be confused when you miss the train. Use the waiting time wisely to go to the toilet. Bring some snacks and bento to prevent growling stomach. Bring some books and musics to get rid of the boredom (well, staring at the train's window is also fun) . Pack your clothes wisely so you don't need to bring a heavy luggage. Hi, Im D. my friends and me will going for japan trip dis april. we plan to start from osaka to tokyo. I would like to know where i can buy this Seishun 18 Kippu in osaka? Because from you articles its really helps us to reduce our budget especially during travel from osaka to tokyo. And maybe if you dont mind you can share which station to change the train.tq. omg i just realized someone left a comment here. You can buy it anywhere at JR station. If you choose the english menu on the ticket vending machine, last time i did it (2013) there was no "18 kippu" option. You should try japanese menu and guess the kanji. But it'll be much easier to ask the staff, I'm sure they can help. as far as i know, you can use the normal seishun 18 kippu for all JR lines, but not shinkansen. So, make sure you stop at the nearest JR line station for your destinations. It doesn't have to be the main JR station, all small JR line stations are fine.